Posted by Jill S. Schneiderman in book review, BP/Deepwater Horizon oil catastrophe, Dalai Lama, fossil fuel, neuroscience, oil, science. 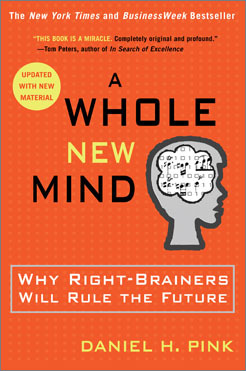 I recently picked up — and couldn’t stop reading — Daniel Pink’s A Whole New Mind: Why Right-Brainers Will Rule the Future, because I reside with three of his so-called “R(ight brain)-directed” thinkers, and as a scientist I’ve lived most of my professional life in a “L(eft brain)-directed” world. So, though I was motivated by personal reasons to entertain Pink’s hypothesis, I was surprised to find currency in his book for two domains that preoccupy me: Buddhism and earth science. Pink, a former speechwriter for Al Gore, argues that we now live in the dawning of the “Conceptual Age”—that which has succeeded the Information and Industrial Ages respectively—and that the skills necessary for survival in this age are, roughly put, art and heart. Pink draws on functional magnetic resonance imaging (fMRI) data, well-known to Buddhists interested in neuroscience, that show how the left and right hemispheres divide their labor: the left hemisphere handles logic, sequence, literalness and analysis while the right hemisphere processes and synthesizes emotional expression, metaphor, context, and “the big picture.” Pink uses these data to argue that L-directed aptitudes while necessary, are no longer sufficient for leading satisfactory lives in the Conceptual Age. R-directed talents including artistry, empathy, taking the long view, and pursuing the transcendent — which were undervalued during the Information Age — are now essential. Pink asserts that the requisite abilities—he characterizes them as “Design, Story, Symphony, Empathy, Play and Meaning”—are fundamentally human attributes, things we do out of a sense of intrinsic motivation, that reside in all of us and need only be nurtured into being. In the chapter titled “Meaning,” Pink refers to the Dalai Lama’s comment at a Mind and Life Institute press conference: “Science and Buddhism are very similar,” he said, “because they are exploring the nature of reality, and both have the goal to lessen the suffering of mankind.” Pink aims to urge the importance in the Conceptual Age of taking spirituality seriously. He offers up examples of ways of doing so—medical schools that teach their students to take “spiritual histories” of patients; village greens, prisons, universities, and hospitals with incorporated labyrinths; employees who articulate hunger for bringing spiritual values—meaning and purpose—to their workplaces as documented in a University of Southern California business school report (A Spiritual Audit of Corporate America). I bring up spiritual values and business because BP is replacing Tony Hayward, the company CEO who presided over attempts to cap the Gulf of Mexico deep sea oil gusher, with a new CEO: Bob Dudley, who says he will put safety at the center of future exploration. Dudley has spoken of the need to restructure and reorganize in order to advance this goal. But safety is a value—a deeply held belief that is beyond compromise; if my reading of Pink is on target, BP’s new CEO, and other oil professionals are going to have to enlist “whole minds” to embrace truly safety as a value. Robots run by computers — inventions of the information age — have worked to cap the well but it took months. Many reasons explain the absence of a fast fix, among them the fact that robots and computers can feel no empathy, don’t see “the big picture,” can’t handle context, and don’t work creatively; and approaches to the calamity sprang primarily from L-directed thinking of oil professionals—logic, sequence, and analysis. If BP enlisted R-directed thinkers and got the benefit of what Pink calls their “high concept-high touch” abilities—emotional intelligence, imagination and creativity—could the company (and others like it), move “Beyond Petroleum,” (BP’s recent and now-ironic) marketing slogan? In The New Division of Labor: How Computers are Creating the Next Job Market, economists Frank Levy and Richard Murnane write that the future belongs to people who excel at expert thinking (solving problems for which there are no rules-based solutions) and complex communication (persuading, explaining, and conveying information). The solution to the BP disaster and future crises like it will not be a new design for deepwater drilling. Rather we’ll need imaginative, emotionally intelligent, R-directed professionals working alongside L-directed professionals in the oil industry. But that’s not all. And in order to make my point I’ll refer to the myth of Pandora, a story I’ve previously found useful in connection with the Gulf of Mexico oil catastrophe. According to the legend, Pandora opened her jar—a gift from Zeus—and the evil it contained escaped and spread over the earth. Pandora hurried to close the lid, but the entire contents of the jar had escaped, except for hope. I’d like to argue that the analogous gift that “Pandora’s Well” might still release is the human valuing of right hemisphere brain functions—synthesis, emotional expression, metaphor, and context; if so, with regard to human use of fossil fuels, we have the possibility of acting on “the big picture” with a whole new mind. This entry was created by Jill S. Schneiderman, posted on July 28, 2010 at 12:28 pm and tagged Environment, Science. Bookmark the permalink. Follow any comments here with the RSS feed for this post.